After completing its first two segments, Flight 610 departed Salt Lake City at 12:11 a.m. en route to its next destination of Denver. At around 1:47 a.m. Flight 610 reported to traffic control that it had passed the Cheyenne radio range station and requested lower altitude, which was granted to 8,500 feet. At that point, Flight 610 was scheduled to make a right turn to intercept the 168 degree course line of the DEN low frequency range, and then to proceed to the WONT intersection, which was its next clearance limit. To intercept that course line, the plane turned to a heading of approximately 210 degrees, which was a proper intercept angle of almost 45 degrees. If the pilot had configured his audio selector switches properly, he would have been able to hear the aural Morse code identifier of "A", for the north side of that low frequency range, and then as he neared the course line itself, he would begin to hear the "N" identifier. That would be the signal that it was time to turn left again, and track the 168 degree course line to the WONT intersection. But, the plane never turned left again. Instead, it remained on that 210 degree intercept heading, until impact. 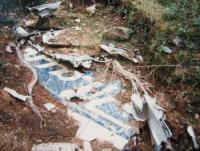 United Flight 610 originated in San Francisco and was scheduled to Chicago, Illinois, with en route stops, among which were Oakland, Salt Lake City and Denver. The flight, which was carried out by DC-6 "Mainliner Overland Trail", departed San Francisco on schedule at 19:15 and after stopping at Oakland proceeded to Salt Lake City, arriving there at 23:24. It departed Salt Lake City at 00:11, 26 minutes behind schedule due to the reloading of bulky cargo. The aircraft climbed to the cruising altitude of 15,000 feet. At 01:47, the flight reported having passed the Silver Crown fan marker (located 12 miles west of Cheyenne) and requested a lower altitude. ARTC cleared the flight down to 8500 feet. After crossing the Cheyenne range station at 15,000 feet the crew then executed a right turn to a heading of 210 degrees, descending to 8,500 feet. The correct heading for the airway to Denver however was 168 degrees. At 01:56 the flight reported reaching its assigned altitude. 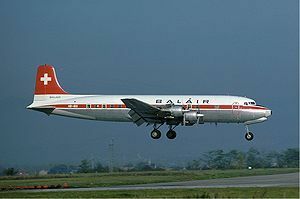 The DC-6 was now flying dangerously close to the mountainous terrain. At around 02:00 it struck the side of Crystal Mountain. 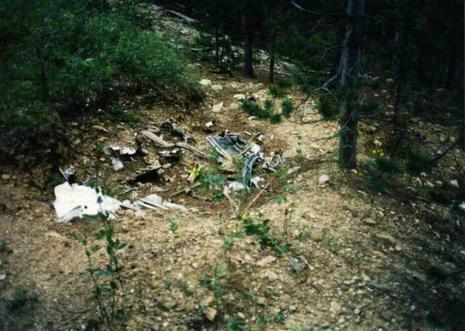 The scattered wreckage of a missing United Airlines DC6 has been sighted in the foothills of the Rockies 25 miles west of Fort Collins, Colo., the Wyoming director of aeronautics reported today.